Here’s another excellent video from CrossRoads Kids Club. 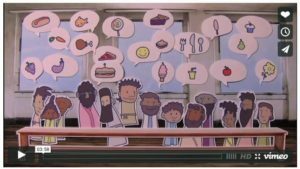 It’s part of their “God’s Story” series and teaches about the Lord’s Supper in a child friendly approach. Download the video by going HERE. They also have a printable poster about this story. It’s designed for families to observe Good Friday together. (Luke 22:14-23 ESV)And when the hour came, he reclined at table, and the apostles with him. And he said to them, “I have earnestly desired to eat this Passover with you before I suffer. For I tell you I will not eat it until it is fulfilled in the kingdom of God.” And he took a cup, and when he had given thanks he said, “Take this, and divide it among yourselves. For I tell you that from now on I will not drink of the fruit of the vine until the kingdom of God comes.” And he took bread, and when he had given thanks, he broke it and gave it to them, saying, “This is my body, which is given for you. Do this in remembrance of me.” And likewise the cup after they had eaten, saying, “This cup that is poured out for you is the new covenant in my blood. But behold, the hand of him who betrays me is with me on the table. For the Son of Man goes as it has been determined, but woe to that man by whom he is betrayed!” And they began to question one another, which of them it could be who was going to do this.